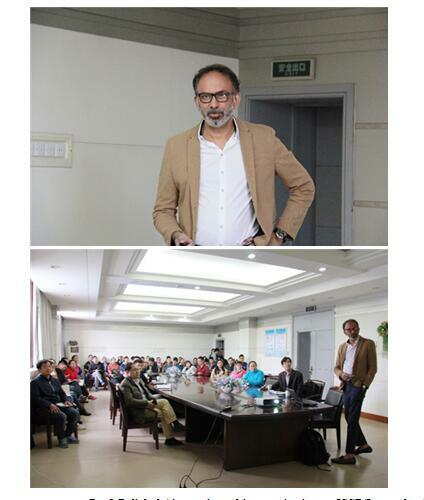 On the afternoon of April 14, Prof. Pulickel Ajayan from Rice University was invited to visit the Institute of Solid State Physics (ISSP), Hefei Institutes of Physical Science. Prof. Ajayan delivered a lecture titled "Materials Science with Two-dimensional (2D) Atomic Layers". He introduced the growth of single layer 2D materials by chemical vapor deposition, such as MoS2, graphene, etc., and methods of preparing multidimensional 2D materials based on the doping and chemical modification of these 2D materials. After introducing the 2D materials, he described the 3D structural materials from 2D building block materials, such as superelastic covalently bonded 3D graphene foam fabricated from 2D graphene oxide. After the lecture, he conducted in-depth exchanges and discussions with the researchers present. Prof. Ajayan showed rigorous thinking, extensive scientific research fields, and rich knowledge. Prof. Ajayan's research focuses on developing functional nanostructured materials for various applications. He has made remarkable achievements in energy generation and storage, chemical sensors, nanoelectronics, flexible displays, high performance composite, membrane technology, coatings, and biomedical technologies. Prof. Pulickel Ajayan has been elected as a fellow of the Royal Society of Chemistry (UK), AAAS, foreign fellow of the Mexican Academy of Sciences and National Academy of Sciences (India), and has been elected honorary member of Materials Research Society of India and the Indian Institute of Metals. His major research covers nanomaterials, nanotubes, 2D materials, nanocomposites, and energy storage materials. He has published more than 850 journal papers such as Science, Nature, and PNAS, with nearly 70,000 citations and an h-index of 130, based on the ISI database. He has received several awards including the Spiers Memorial Award by the Royal Society of Chemistry (UK), Senior Humboldt Prize, MRS medal, Scientific American 50 recognition, RPI senior research award, the Burton award from the microscopic society of America and the Hadfield medal for the outstanding student metallurgist in India.